Beyond his brilliant ACB and NBA professional career, Pau Gasol is the perfect example of how transmitting and instilling healthy habits during childhood, is both crucial and beneficial into adulthood. A healthy diet, associated with a good rest routine, the promotion of emotional well-being, and an active lifestyle, have played a significant role in Pau’s entire life, and is responsible for much of his success both on and off the court. The eldest Gasol brother strongly feels that his family unit, upbringing, and environment have been crucial when it comes to his education and implementation of adopting a healthy lifestyle. His parents, Marisa and Agustí, both come from careers in the medical field. Because they are both healthcare professionals, they felt it was necessary to instill in their children what it means to be healthy. For as long as Pau can remember, his mother and father have always stressed to him and his younger brother Marc, that health should be at the center of their family routines. In the same manner in which their parents planted the seed, Pau and Marc wanted to continue this mission of educating other individuals about the importance of healthy habits. In order to do so, they founded the Gasol Foundation in 2013. After many years of working closely with various organizations and collaborating with numerous entities at the forefront for children’s health during their careers, both wanted to make an impact on a cause they felt very passionate about. Faced with the growing epidemic of childhood obesity around the world, the Gasol brothers decide to focus all their efforts and economic resources on their foundation, whose main objective is to promote programs and initiatives centered around the healthy habits they both learned about and practiced in their childhood. Through their foundation, they decided to specifically focus on families who live in vulnerable, low income areas. The reason being is that these particular individuals often have limited resources, fewer opportunities for physical activity, lack of access to healthy, affordable foods, are more susceptible to higher levels of stress and poor mental health, and are more exposed to the marketing of obesity-promoting products. Pau explained, “A healthy life should be available to all families, despite economic condition. Our goal with the Gasol Foundation is that healthy habits become a key concept in the education of children, involving their nuclear family- undeniably their example to follow “. 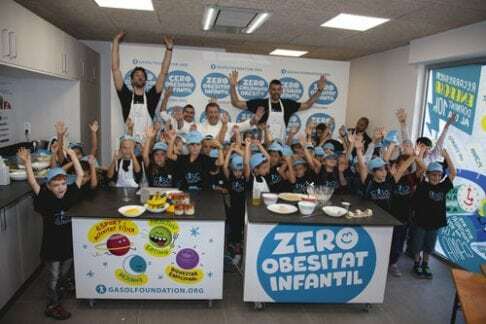 Five years after the launch of the Gasol Foundation, Pau has become the spokesperson for its “Zero Childhood Obesity” initiatives. Together with Marc, and the help of an interdisciplinary team of professionals, the foundation continues its mission: to enrich the lives of thousands of children around the world, by helping them to become a more stronger and healthier generation. These children will be able to have a better understanding of healthy habits and will be able to apply these habits in their lives for years to come.